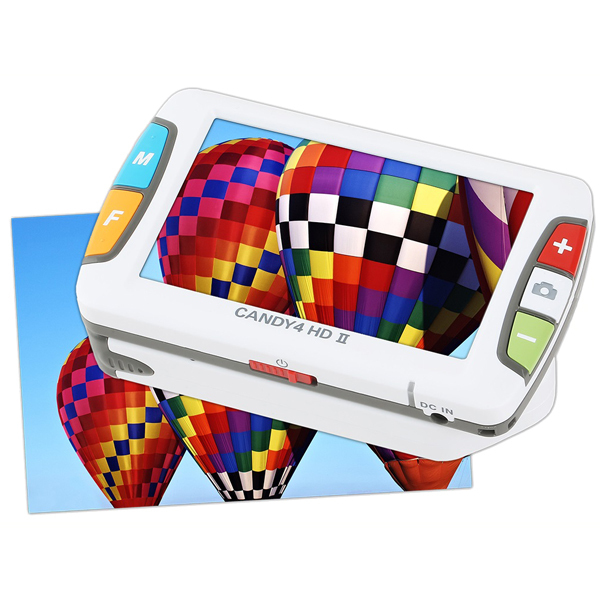 CANDY 4 HD II is a lightweight handheld (with handle) 4.3″ LCD HD video magnifier, with a sharp high-contrast image, that you can conveniently carry with you in your jacket or purse wherever you go. Continuous zoom magnification from 2x – 20x, easy-to-find controls and user-customizable text and background color combinations make CANDY 4 HD II the perfect companion for students, seniors and others with low vision. The new CANDY 4 HD II features a 4.3” high-definition wide-screen LCD and continuous zoom magnification from 2x – 20x. This versatile video magnifier has an intuitive center-position HD auto focus camera and can be used as either a “handheld” or “stand” magnifier. Use CANDY 4 HD II at home or take it with you to school, work, restaurant, pharmacy, bank, library, grocery or department store or on vacation. The new CANDY 4 HD II features a 4.3” high-definition LCD, ensuring a clear, high-quality image. The large LCD display provides 4x greater field of view than a similar magnification optical magnifier, and the HD image quality provides a 3x higher resolution from the camera to the LCD. Easily customize 3 selectable color modes from a number of preset combinations in addition to the standard natural color mode. Users can also disable unused options to simplify menu choices to only those which they use most often. Featuring 2.5 hours of battery use time on a full charge, CANDY 5 HD II has the longest lasting battery run time among handheld video magnifiers. The built-in rechargeable lithium battery recharges within 2 hours with the included AC adapter. * Weight: 1/2 lbs./ 256g.